The level will feature a variety of re-usable and some one-off assets. I will be using my experience of modelling in 3D Studio Max combined with recent skills learned in the classroom with Maya to produce some simple, low-polygon assets which keep the level within the 120k triangle limit. This asset will be reused 3-4 times in the level. For the door, I started with a primitive cube with 3 divisions along the x and y axis. These divisions allowed me to create a perfectly square face in the center of the door, which I then moved 2/3 of the way to the top of the door. I then added 2 divisions to this face’s edges, selected these edges and used the Circularize tool to lay the vertices out in a circle. I then deleted the face to provide a space for a bevelled edge using a pipe primitive. 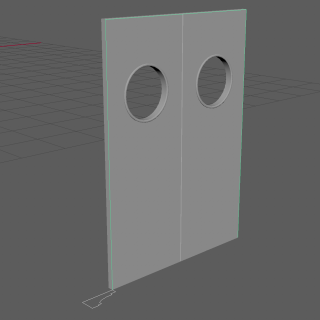 I used a separate pipe object for the porthole edge so I could easily UV it later. 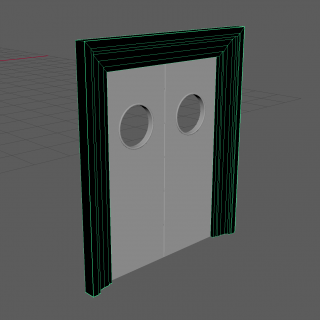 I added some bevel to the exposed corners of the door, then mirrored it on its x-axis to produce double door. 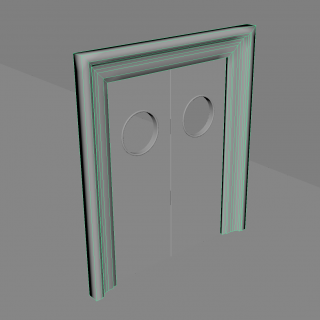 For the door frame I decided to use the Extrude tool using a linear EP curve for the path and another linear EP curve for the shape. I used vertex snapping to draw the path precisely along the edge of the door. I then drew a profile of the wooden door frame and again used vertex snapping to position this at the start of the extrusion path. I ran into an issue here as the extrusion produced a mess of faces. I realised that I was selecting the shape and path in the wrong order, so once this was rectified, the door frame looked good. 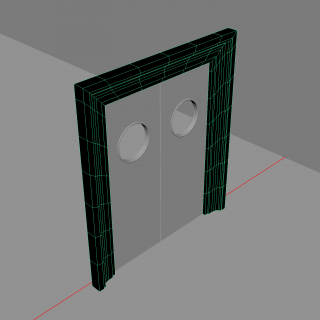 Completed doors with the EP curve path and shape in position. Shape extruded along path to produce a NURBS object. NURBS object is converted to a polygonal object using Modify > Convert > NURBS to Polygons. I also deleted unnecessary edges to reduce the polycount. Reversed all the face normals. Note that the object has changed from black to grey, showing that the faces are reflecting light in the correct way. 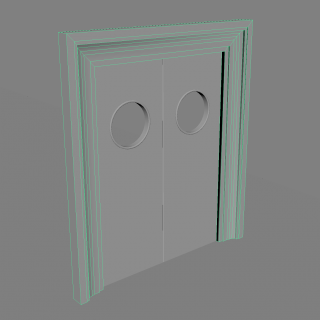 Finally I hardened some selected edges to produce a realistic door frame.